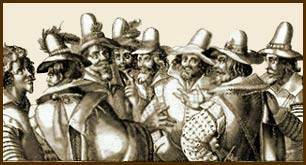 This picture is of the ‘Gunpowder Plot’ conspirators: Thomas Bates, Robert Wintour, Christopher Wright, John Wright, Thomas Percy, Guy Fawkes, Robert Catesby and Thomas Wintour. Guy Fawkes is also referred to Guido Fawkes, which is the name of a blog I like to read on a regular basis. Guido calls himself “the only man to ever enter Parliament with honest intentions”!